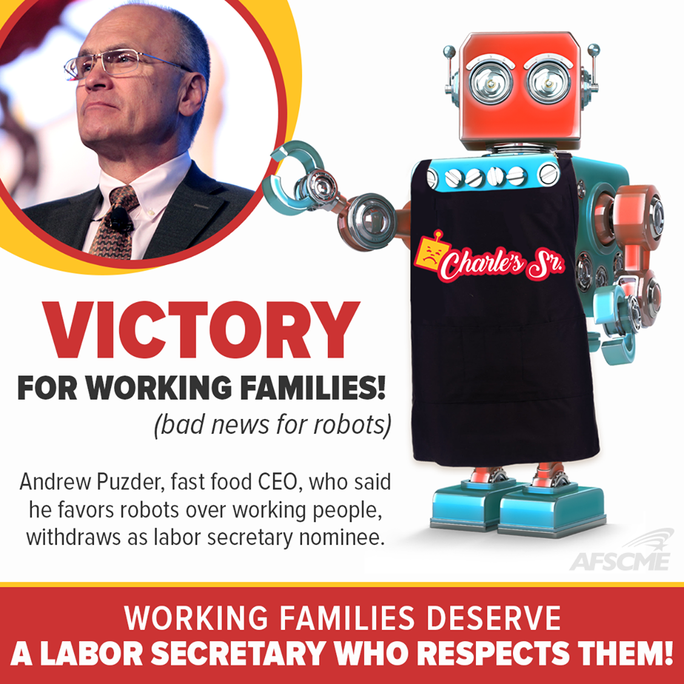 Today’s report that fast-food CEO Andrew Puzder is withdrawing from consideration as Labor Secretary is a major victory for working people in California and across the nation. Puzder’s abysmal record of violating his own workers’ fundamental rights and his abhorrent treatment of women made him unfit to lead the very department charged with protecting workers. Working people across California spoke out forcefully against Puzder’s confirmation, ultimately helping to tank his ill-advised nomination. Dozens of demonstrations and online actions in California amplified the growing national concern about Puzder’s actions as CEO of CKE Foods, which included cheating his own workers out of their hard-earned wages. We salute all the brave workers from Puzder’s company who spoke out against him through the Fight for $15 campaign. This victory is testament to the power working people have when we stand together to make our voices heard. America’s workers deserve a Secretary of Labor who will look out for their interests. We urge President Trump to listen to the voices of working people and nominate someone to head the Labor Department who will protect them from greedy CEOs like Puzder.